Otranto port accommodates yachts, local fishing boats, and freighters that haul cement products across the Adriatic. Also to be found here are vessels of the coastguard and customs service as the Italian state monitors the waterways between Puglia ('the heel of Italy'), Albania and Corfu. Alongside the port, is the Stazione Marittima building with services for port users. The port of Otranto is located approximately 1.5 km's from the city center. Also known as The Gateway to the East, Otranto is a tourist town in Apulia, in the Province of Lecce, situated on the easternmost point of the Salento Peninsula, the ‘heel' of Italy, which connects the Adriatic and Ionian Seas in the heart of the Mediterranean. Otranto is a town of art and the neighboring town is Lecce known as the Florence of the south'. Otranto, town (1991 pop. 5,114), in Apulia, extreme S Italy, on the Strait of Otranto, which links the Adriatic and Ionian seas. It is a small fishing port and a seaside resort. 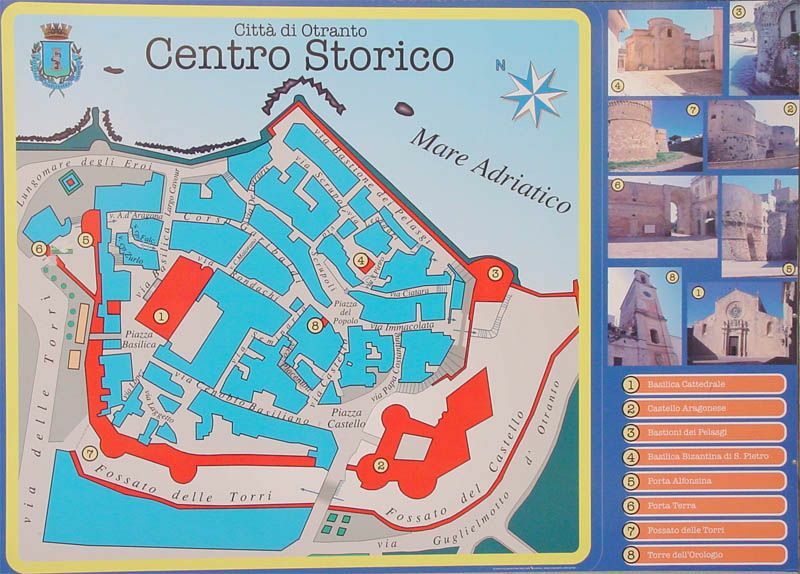 Originally a Greek settlement, Otranto became an important port under the Romans. Later ruled by the Byzantines and the Normans, it never recovered from its devastation (1480) by the Turks. Of note are an 11th-century cathedral (restored 17th–18th cent. ), considered the biggest church of Puglia. with a fine mosaic floor (12th cent.) done by a monk, preserving the remains of the 800 martyrs killed by the Turks; and the ruins of an imposing Aragonese castle (15th cent.) that provided the setting of Horace Walpole's Gothic novel, The Castle of Otranto. The coastal road which wends its way towards Castro is one of the most alluring touristic routes in the region, with its ups and downs which sometimes reach heights of eighty meters above the sea, and its winding route, it seems to have been planned by nature to hold the interest of a traveler in search of new emotions. The Tourist Office is at Piazza Castello. There are buses and trains going to Lecce and other towns. The Uragano Villages: Salentine Greece is a geographical air-pocket which speculates on the Greek colonization and the progressive Hellenisation of Southern Italy, it now includes the districts of Calimera, Castrignano dei Greci, Corigliano d'Otranto, Martano, Martignano, Melpignano, Soleto, Sternatia and Zollino, in the heart of the east Salento region, where traces of the Greek-Byzantine civilisation linger on and Griko, the idiom or dialect which is surprisingly close to modern Greek, still survives. The Greek enclave can be easily reached by car from Lecce, Otranto, Gallipoli and Santa Maria di Leuca. It is filled with outdoor cafes and shops that overlook the water.